The women's Kurti is an invention out of the men’s top kurta. In ancient time, it was popular in countries like Afghan, Pakistan, India & Bangladesh. Men used to wear a long shirt type top (Kameez) with dhoti or pajama. With the passage of time, the kurti entered a top in women’s wear. For your general knowledge, it is also as old as saree. We can say as on the date that both are most popular as a women’s ethnic wear. In the past, Kurtis only came in short length, lying up to the waist. Then knee length became popular as a middle length & floor touch came in trend and became popular. Kurti is a top that is available in a variety of lengths short, long and knee. Some people refer to kurti as tunics. Today in India and in many places abroad, women like no other garment as an ethnic kurti. The rationality for women choice is its comfort level and smart look. It can be well coupled with leggings; Churidars & jeans give a gorgeous look. Cotton kurti is the ideal top for summers. The trend changed with time, the use of tops began in Bollywood by an actress in movies. It became the pathway that led it to enter the Indian fashion market. All the credit goes to designers, who did put all the effort to develop Indian Bollywood Kurtis. They experimented with neck, sleeves, cuff and back pattern. And then further went on to experiment with traditional handwork and embroidery work. They also tried various types of fabrics available where each one gave a different feel and fall. They implemented digital prints along with traditional hand block prints in this segment. Latest digital prints & handprints attracted girls because of variations & varieties in design. As a result, you see various best designs of kurtis for women in the current fashion of India. Undoubtedly it has established itself as the most demanding ladies wear. Day by day, its craze is increasing with each passing day among the teen mod girls. Fashion is what you really make out of it. It depends on how you promote yourself in society with your appearance. Today’s women are aware of what to wear and what to avoid at different occasion. They adore it, which suits perfectly for the occasion. It is now considered as an Indian traditional wear of teen girls. There are so many reasons behind kurtis popularity. It is the instant availability in the form of ready to wear. Anyone can instantly dress-up in this busy world. It comes in pleasing color combination, team up with any palazzo or leggings is possible. You can wear it with a western bottom wears like jeans for a trendy look. These latest kurti designs are available in hips of patterns at a low price. The pair of it costs very low which is affordable for everyone. Kurti is available in various lengths, patterns & fabrics. Some tops come with floor length, waistline, short, semi-short middle length (knee line). The cotton tops are perfect for the humid and hot climate. You can wear comfortable cotton kurtas daily to the office & at work. Heavy (thick) polyester georgette, chiffon & velvet fabric top is suitable for freezing climate. A silk kurta is also ideal to wear on special celebrations like weddings & parties in every season. Digitally printed kurtis are available in infinite patterns. Patch worked, lace patterned and embroidered kurtis. Mix and match styles of solid color with block printed one & mixing of sober or contrast color. Various Collar, neck back, Front slit, high-low cut, asymmetric cut, c. cut & straight cut patterns are special features of Kurti. It is a classy and stylish women’s wear that enhances the natural beauty of them. Proper Matching of accessories will enhance the beauty of the wearer. Go for appropriate size, shape & finish of bindi, jhumki earrings, bangles & necklace. The appropriate handbag will take the look of a woman in kurti to the next level. Choose Contemporary clutch, tote, Hobo, Satchel or Purse according to Occasion. Woman’s all-time favorite crafted tops come in various materials, styles & patterns. Few very well known basic fabrics are cotton, georgette, silk, viscose, rayon & chiffon. Most of you would have never heard of other types that we will highlight below. So, from now onwards it will be easy for Women to buy kurtis from good online shopping sites of India.You can Buy best girls kurti design with new patterns from our online store. Choose the perfect fabric by reading the product description. Don't buy if full description it isn’t mentioned or not provided on demand by a seller. Kurti is a fashion rage among style-conscious ladies. Girls like to wear it because they can pair it with any type of bottom wear. Designers combined vibrant colors with modern cuts to give a modern appeal to it. Ladies Team up Indo Western kurtis with the latest bottom wears like Capri, jeans & pants. The unique feature of Women kurtis is, one can wear it for any occasion. The simple kurtis are popular as ladies casual tops, which are suitable for day-to-day life. Hence, no traditional artwork applied to it. It is available in various colors and fabrics. The south Asian women wear it for the comfort that they want while working in household chores. Short kurtis are like men's shirts or ladies T-shirts style. It comes in various sizes like above or below the waistline with short sleeves or sleeveless. Printing patterns are like various western style tops, sari-style or men's shirt type. In recent fashion, short tunics come in denim material. Any girl can try it with jeans, leggings or palazzo style pants. This is the reason behind the immense demand for these types of short tops among college girls. Visit our short kurti section and you will find the wide range and you will appreciate our team's hard work. 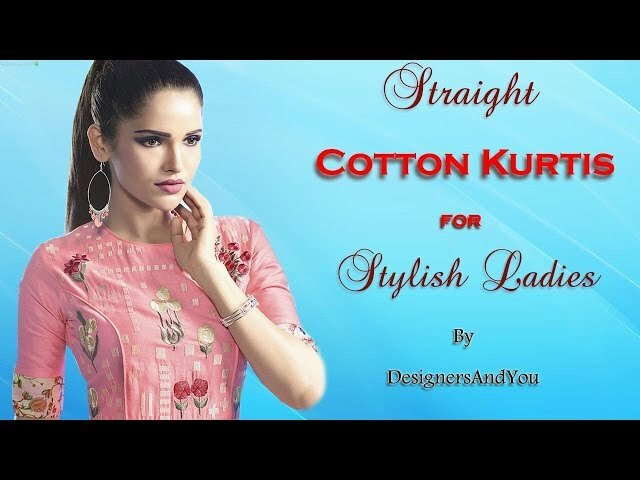 Pakistani kurti are straight and long. Females prefer to wear heavy embroidered & worked Kurtis on special occasions. The Kaftan style kurti: This garment has wide sleeves and is very baggy gives fantastic style. The comfort level, it provides makes it a top choice today. C cut kurtis: As the name suggests this unique garment has a "C" shape in front. You can say it reverse "U", a deep cut from one front edge to another edge. Pair it with nice accessories to be the center of attraction for any occasion. Double-layered kurti: the name itself explains the style. It has an extra layer that gives it a unique look. There may be two, three or many layers. High-low kurti: This kurti is low in length from the back and longer in the front. Anarkali kurti: This gown type kurti gives a very decent and graceful look. One can wear it to attend important occasions and functions. Indo western kurti: As the name suggests this kurti is a blend of Indian and western fashion. The distinctive look is due to different type of cuts, shapes, neckline, and sleeves. Leggings and jeans enhance its look, its 1st choice of fashionable Females. Crape fabric: Crape is a type of georgette fabric. The fabric gives a dual type of feel and fall. Soft luster and a bit rough is its main characteristic. Modern fashion wears an Indo western style Kurtis in crape fabric is popular in hi-fi society. Crape kurtis are in high demand because of its feel fall. Rayon fabric: This type of fabric is best for print work. The effect of print on rayon looks better than any other fabric. It is also smooth as cotton, but a bit heavier than cotton. There are thousands of new patterns of Kurtis are available in long, medium and short sizes with vivid cuts. You may find fancy & stylish party wears kurtis in georgette, chiffon, crepe & rayon fabric. Straight cut long trendy ladies tunic tops etc. are also in Trend. These fabrics are raw material to produce above-mentioned kurtis. Both velvet & silk give a glossy touch. Due to its characteristics, it is possible to create several heavy works. Embroidery, mirror work (Shisha), hand-embroidery (Aari) and much more works are possible in a Velvet or silk Kurti. A knitted Kurti is in trend because of its lightweight and stretchable property. It comes with various detailed hand works. It looks exclusive with jeans top and wearer look trendy in this pair. Satin material is a one of the favorite material of designers to make tops. They get the desired shiny look they want in satin fabric for night parties tops. Hence, nowadays girls like to buy designer tops made with satin fabric. Cotton is a natural thread, which is most popular to produce summer wear. Cotton made-ups are always in demand from Asian and African countries. It is an evergreen fabric, which is always in demand. Let us try to understand this category and enhance our knowledge. The kurta made from cotton or linen fabrics are always in demand. These Tops comes stitched without a collar containing buttons on bodice area. The most common identities are the full sleeves and comfort fitting size up to shin (mid-calf) length. Once you check the size and the neck patterns then you can easily identify it. The kurti fixed its place for many reasons in the hearts of millions of women and it’s no confusion. By looking at today’s ladies kurtis, we can say that the western tunic tops styling is influencing it. The complete style is changing and creating it as the uncrowned queen of the Indian fashion. Other Indian ethnic outfits are also somewhat influenced by the western trend. Hope this information will be helpful to girls in the buying of tops. It is must and should to understand own body shape before buying tops and matching bottom wear. The costlier branded outfits won’t give the desired look what every woman and girl want to achieve. We all know that kurtis tunic has been in demand for a long time and it will remain in trend future as well. Be very choosy while buying kurti tops. It is not necessary that all branded tops are best. Don't spend an extra amount (even a single penny) on the brand name or store name. Denim: this type of fabric is not as popular as other fabric, but still you can find few denim tops. This type of tops most suitable for winter and worn by females globally. Linen: It’s a special kind of cotton fabric. It is raw material (fabric) of rich looking summer kurtis. It has elasticity and fabulous absorbing power of heat too. Hence, Indian females love wearing such tops during hot days. Fashion is all about pairing proper tops with appropriate bottom wear. The right bottom wear is as important as a top. Negligence of proper matching will affect (100%) to your appearance. Some styles can don't need any costly bottom wear. It depends on the event and quality of gathering, whereas bottom wear is necessary or not. Hence, here we will give you some tips for the specific body type that will be important for all the ladies. This type of shower is exactly made in the Arabic style pattern. It looks exactly the same as traditional Arabic belly dancer's bottom. Its pattern is loose to tight fitting style from waist shin; it will work well on all body types. This bottom wear is available in two sizes one is up to floor length and the other is up to just above ankle length. A girl with any body type can wear it with either long or short top. It is best to wear in the summer for extra comfort. A legging is stretchable and looks best on sleeveless kurti top. It sticks with the body; hence, extra skinny and chubby girls should stay away from it. Few girls do not like to wear tapered jeans but want a similar look for them must give it a try. This type of Salwar with knee-length embroidered kurtis can maintain the ethnicity. Salwars made of cotton and silk fabrics are the perfect choice for long Top. It will be suitable for all body types but it isn’t appropriate to wear with short tops. It used to be the most common bottom wears with kurtis tops in the old days. Before it was available in limited dark colors, but now it is available in a variety of colors and prints. Chubby women and skinny girls must avoid such leggings with short kurtas. Because it sticks with the body, hence it will expose the heavy thigh line. kurtis with beautiful patterns of neck pair with leggings for a stunning look. There are two types of Patiala Salwar, semi Patiala, and full Patiala. Girls can choose any of them pairing with short kurta designs and it is most suitable for all kinds of body types. The special effect of the stitching pattern can be effective in getting a trendy look. This one is very popular among teenage girls. It can be best paired with short kurtas and is only suitable for the perfect body shape. Kurti with Chinese collar, back, sleeveless & button looks best with dhoti style bottom. There are many types of palazzo available in different sizes & different colors. Any girl can make the best pair of baggy length pants with kurti tunic for a retro style look. But try and avoid those with short tops because it’s not suitable for it. This type of bottom is suitable for formal style kurtis. We recommend wearing it in corporate culture and it is suitable for the perfect body shape. This style gives a narrow fitting and is a little bit short in size. The length is up to the ankle or above the ankle for pants. Best to pair with any type of fashionable short tops designs. From the above styles, a girl can choose any as per need and make the best pair of tops in modern fashion. Jeans and Capri will suit with the shirt type short kurta. Any type of kurtis that is parallel to waistline will go best with jeans and Capri. You can dress up long kurti above thigh length, but above that, jeans and Capri are not recommended. Now, one can find the unique collection of designer women’s kurtis online. We have stepped in times when everything is available online. From something, as common as a dog tag to luxury cars you can buy through the Internet. Fashion conscious women can update their kurtis collection wardrobe by shopping online. E-commerce satiates your need for variety; it also brings everything to your doorstep. Best quality at very reasonable prices, which is too good to be true for you. Moreover, the convenience of home shopping is unbeatable. To finally sum up, if you have got a wedding invitation and if you are stuck on what to wear dilemma, don’t worry! You can get kurtis for every mood and occasion here. Enjoy shopping online at our e-store (Your own boutique).